Despatch Conveyor Ovens are designed for process versatility and reliability. They achieve superior air temperature uniformity on all interior parts due to high-volume, vertical down airflow. The continuous belt design is ideal for large quantities of similar work pieces being processed. 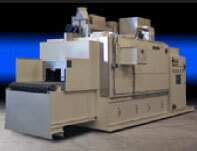 Typical applications include pre-heating, curing, bonding, drying and heat treating. Options include Class A models specifically designed for flammable solvents and a HEPA (High Efficiency Particulate Air) filtered model for applications that require Class 1000 cleanliness. These ovens provide extremely consistent and repeatable process results. 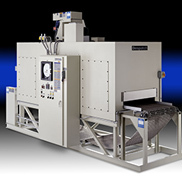 An optical manufacturer needed a conveyorized thermal processing oven to dry the coatings on its eyeglass lenses. Despatch designed a custom PC Series conveyor oven with HEPA filtration to meet the customer’s requirements for high-volume production while maintaining a clean internal atmosphere. The conveyor oven operates at relatively low temperatures and was designed to be compatible with the customer’s robotic loading equipment. The PC Series Conveyor Oven features superior temperature uniformity with temperatures up to 260°C (500°F). Conveyor speeds are variable and Class A models are available. The Despatch Glass Processing conveyor oven was designed for high volume touchscreen and LCD glass manufacturing. The system incorporates infrared heating technology with a continuous belt for fast heat up and processing of the product. We know all LCD glass manufacturing processes are unique and we are here to help. We are committed to working with our customers to learn the details of their touchscreen and LCD glass process in order to design and engineer a custom piece of equipment that will meet each customer’s specific processing needs. Our infrared systems consist of a load station, multi-zone infrared heating and cooling sections and an unload station. 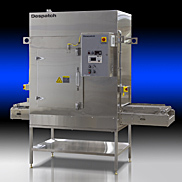 Despatch infrared conveyor ovens include a patented drop down chamber for easy maintenance, the ability to control atmosphere to reduce oxidation and closed loop temperature controls for tight uniformity. Systems are controlled by an industrial PC and contain a custom Despatch furnace control application with an easy to use graphical user interface. 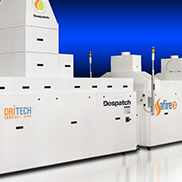 Despatch has manufactured a low-temperature, conveyor oven for a global medical technology company to use in their unique curing application. The oven design is unique in that it includes two belts to allow two separate product streams to be processed in the oven. Another unique feature is the 260°F temperature rating which allowed us to use an FDA approved, continuous fabric polyester-butyl belt that provides a solid product support surface. Despatch worked closely with the customer to lay the oven out with control devices and maintenance access positioned to optimize access at the installation location. 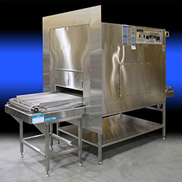 Despatch has designed and manufactured a custom conveyor oven for a global surgical device supplier. The oven features a 44” wide stainless steel flat wire process belt that passes through a 650°F heated zone, then through a cooling zone with ambient air cooling. Further cooling time is provided on an extended outfeed section which is equipped with an exhaust hood that can be ducted to a customer supplied stack. The oven is also equipped with HEPA fresh air filters in the heating and cooling zones to help maintain low particulate air within the process chambers. Despatch provided a detailed FAT acceptance test on completion of this project. 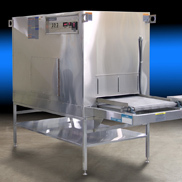 To ensure the oven was designed and adjusted properly prior to leaving the factory, the customer sent a set of specialized trays used in their process to incorporate into the FAT acceptance protocol. 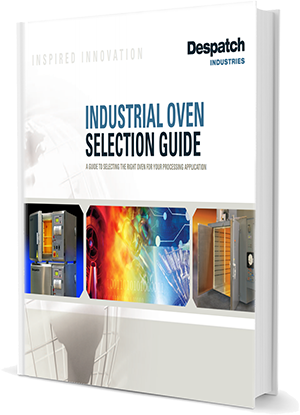 Despatch test technicians and engineers used their understanding of oven dynamics and heat transfer, as well as documentation from similar ovens, to rapidly set up and execute the acceptance test and approve the unit for shipment.